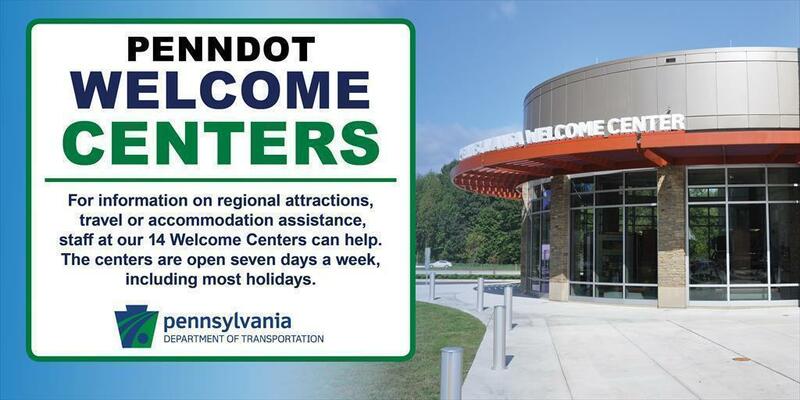 Did you know that PennDOT has Welcome Centers? When you’re traveling on the road, Welcome Centers are there to assist you! Welcome Centers are strategically located along Interstate entry points to assist travelers as they enter the state. The centers are open seven days a week, including most holidays, from 7 a.m. to 7 p.m., unless otherwise noted below. Also, all our centers offer Free Wi-Fi and a free reservation service. For information on regional attractions, travel or accommodation assistance, staff at our 14 Welcome Centers can help. Our tourist information counselors can make reservations for hotels, campgrounds, and restaurants. Do you ever get hungry on the road traveling? Our rest areas have vending machines within their facilities and are available to travelers 24/7 per day. When you do stop at our Welcome Centers, if you receive exceptional service or would like to provide other comments, email that center using one of the links below or alert our Tourism Services Manager at ra-pdtoursvcsoffc@pa.gov. You can view the Welcome Center Map or review the following list of centers, locations and contact information. For more information on Welcome Centers, visit www.penndot.gov/TravelInPA.